Mom's posole all dressed up with shredded cabbage, radish, onions, cilantro and lime. There are a few dishes that both my parents make where I definitely, on the downlow, prefer my mother's version hands down. Unfortunately for us kids, neither mom or dad ever write their recipes down. And like most recipes passed down from generation to generation, a lot of our family staple meals were made from learned recipes and never measured. It's a palmful of this, a pinch of that to taste, a teacup of that... all feel and guestimations. But mom's was always consistently spot on! And this is basically her recipe (as much as I can "guess"! LOL). 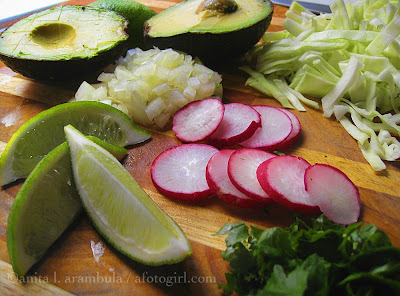 When it's cold and breezey and sprinkley, this is the soup I crave with corn tortillas fresh from the tortillaria. 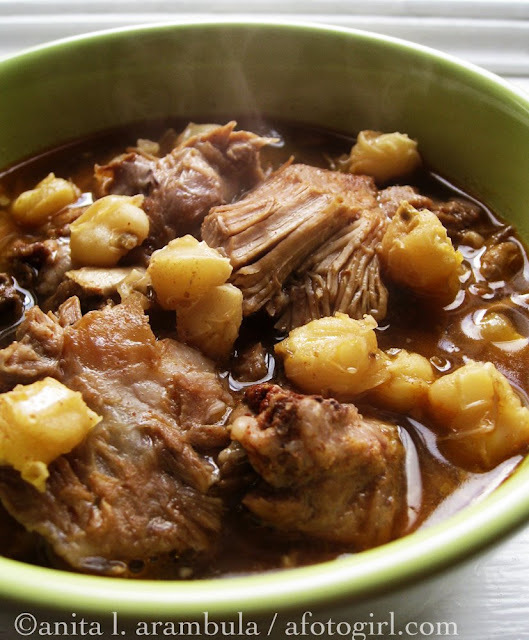 Posole (or Pozole) is a peasant dish from Mexico traditionally made with pork neck bones, chili and hominy (dried maize – or corn – that has been treated with an alkali making it not only more digestible but significantly increases the nutrient value of untreated corn). If however, your local ethnic grocery store doesn't have neck bones, you can easily substitute it with a cubed pork roast or my preference, country style pork ribs (bone-in). 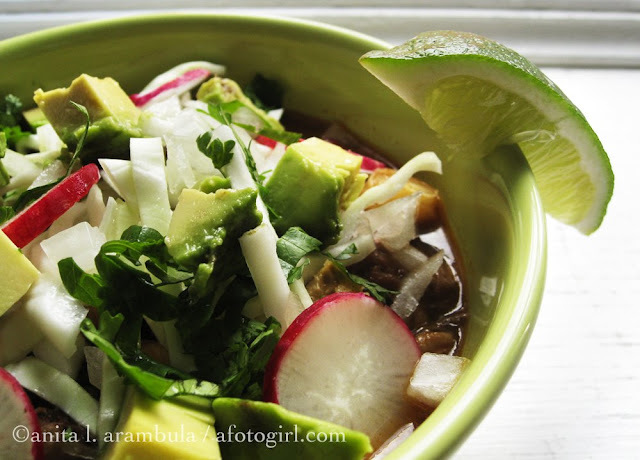 I made this soup for lunch during our tamalada and it was a huge hit. At that time I made enough to nearly feed an army. This is a much more scaled down version but still enough to feed about 8 -10 people as an entrée. As with most soups and stews, flavors will concentrate overnight making this a great budget-conscious recipe as the leftovers can easily be frozen or saved for lunch the next day. Posole - unadorned - nice and steaming! Yum! In an 8 quart stock pot, add first 6 ingredients starting off with only 2 tbs of the bouillon. Simmer on medium to low flame for an hour, occasionally skimming off any foam or fat off the top. After the first hour, taste the broth adding more bouillon or chili to taste. Continue simmering on low for another hour and a half. Add the hominy and simmer an additional half hour to 45 minutes. Meat will be falling off the bone when ready. I can see we're all in the mood for soup today! This looks warming and comforting, exactly how a homemade soup should be. This soup looks incredible. I love the fresh avocado on top. Mmmmmmm, pozole is a Mexican favorite of mine. I make one, but it takes all day to prepare :) Your version looks much easier! I'll have to try this out.